Uncertainty surrounds the fate of the Fort Ancient people. Most likely their society, like the Mississippian culture to the south, was severely disrupted by waves of epidemics from new infectious diseases carried by the first Spanish explorers in the 16th century. 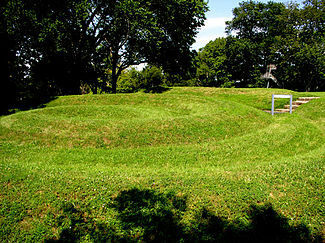 After 1525 at Madisonville, the type site, the village’s house sizes became smaller and fewer, with evidence showing the people changed from their previously “horticulture-centered, sedentary way of life”. The Shawnee traditionally considered the Lenape (or Delaware) of the East Coast mid-Atlantic region, who were also Algonquian speaking, as their “grandfathers.” The Algonquian nations of present-day Canada regarded the US Shawnee as their southernmost branch. Along the East Coast, the Algonquian-speaking tribes were mostly located in coastal areas, from Quebec to the Carolinas. Algonquian languages have words similar to the archaic shawano (now: shaawanwa) meaning “south”. However, the stem šawa- does not mean “south” in Shawnee, but “moderate, warm (of weather)”: See Voegelin “šawa (plus -ni, -te) MODERATE, WARM. Cp. šawani ‘it is moderating…”. In one Shawnee tale, “Sawage” (šaawaki) is the deity of the south wind. Curtin translates Sawage as ‘it thaws’, referring to the warm weather of the south. šaawaki is attested as the spirit of the South, or the South Wind, in this account, in one of Voegelin’s tales, and in a song collected by Voegelin. According to one English legend, some Shawnee were descended from a party sent by Chief Opechancanough, ruler of the Powhatan Confederacy 1618–1644, to settle in the Shenandoah Valley. The party was led by his son, Sheewa-a-nee. Edward Bland, an explorer who accompanied Abraham Wood‘s expedition in 1650, wrote that in Opechancanough’s day, there had been a falling-out between the Chawan chief and the weroance of the Powhatan (also a relative of Opechancanough’s family). He said the latter had murdered the former. The Shawnee were “driven from Kentucky in the 1670s by the Iroquois of Pennsylvania and New York, who claimed the Ohio valley as hunting ground to supply its fur trade. The colonists Batts and Fallam in 1671 reported that the Shawnee were contesting control of the Shenandoah Valley with the Haudenosaunee Confederacy (Iroquois) in that year, and were losing. By the late 1730s pressure from colonial expansion produced repeated conflicts. Shawnee communities were affected by the fur trade. While they gained arms and European goods, they also traded for rum or brandy, leading to serious social problems related to alcohol abuse by their members. Several Shawnee communities in the Province of Pennsylvania, led by Peter Chartier, a métis trader, opposed the sale of alcohol in their communities. This resulted in a conflict with colonial Governor Patrick Gordon, who was under pressure from traders to allow rum and brandy in trade. Unable to protect themselves, in 1745 some 400 Shawnee migrated from Pennsylvania to Ohio, Kentucky, Alabama and Illinois, hoping to escape the traders’ influence. Ever since the Beaver Wars, the Haudenosaunee Confederacy (“Five Nations”) had claimed the Ohio Country as their hunting ground by right of conquest, and treated the Shawnee and Lenape who resettled there as dependent tribes. 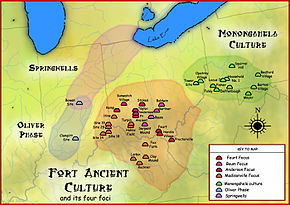 Some independent Iroquois bands from various tribes also migrated westward, where they became known in Ohio as the Mingo. These three tribes—the Shawnee, the Delaware (Lenape), and the Mingo—became closely associated with one another, despite the differences in their languages. The first two were Algonquian speaking and the third Iroquoian. After taking part in the first phase of the French and Indian War (also known as “Braddock’s War”) as allies of the French, the Shawnee switched sides in 1758. They made formal peace with the British colonies at the Treaty of Easton, which recognized the Allegheny Ridge (the Eastern Divide) as their mutual border. This peace lasted only until Pontiac’s War erupted in 1763. The Treaty of Fort Stanwix in 1768 extended that line westward, giving the British colonists a claim to what is now West Virginia and Kentucky. The Shawnee did not agree to this treaty: it was negotiated between British officials and the Haudenosaunee Confederacy (“Six Nations”), who claimed sovereignty over the land, although Shawnee and other Native American tribes also hunted there. After the Stanwix treaty, Anglo-Americans began pouring into the Ohio River Valley for settlement. Violent incidents between settlers and Indians escalated into Dunmore’s War in 1774. British diplomats managed to isolate the Shawnee during the conflict: the Iroquois and the Lenape stayed neutral. The Shawnee faced the British colony of Virginia with only a few Mingo allies. Lord Dunmore, royal governor of Virginia, launched a two-pronged invasion into the Ohio Country. The Shawnee chief Cornstalk attacked one wing but fought to a draw in the only major battle of the war, the Battle of Point Pleasant. In the Treaty of Camp Charlotte ending this war (1774), Cornstalk and the Shawnee were compelled by the British to recognize the same Ohio River boundary as their southern border, which had been established with the Haudenosaunee Confederacy (“Six Nations”) by the 1768 Fort Stanwix treaty. The Shawnee ceded all claims to the “hunting grounds” of West Virginia and Kentucky south of the Ohio River. Many other Shawnee leaders refused to recognize this boundary, however. A Shawnee party attacked Daniel Boone in Kentucky in 1775. In the early 19th century, the Shawnee leader Tecumseh gained renown for organizing his namesake confederacy to oppose American expansion in Native American lands. The resulting conflict came to be known as Tecumseh’s War. The two principal adversaries in the conflict, chief Tecumseh and American politician William Henry Harrison, had both been junior participants in the Battle of Fallen Timbers at the close of the Northwest Indian Wars in 1794. Tecumseh was not among the Native American signers of the Treaty of Greenville, which had ended the war, when the Shawnee and other Native Americans ceded much of their historic territory in present-day Ohio to the United States. However, many Indian leaders in the region accepted the Greenville terms, and for the next ten years pan-tribal resistance to American hegemony faded. Afterward Tecumseh traveled to the Southeast on a mission to recruit allies against the United States among the “Five Civilized Tribes.” His name Tekoomsē meant “Shooting Star” or “Panther Across The Sky.”He told the Choctaw, Chickasaw, Muscogee, and many others that the comet of March 1811 had signaled his coming. He also said that the people would see a sign proving that the Great Spirit had sent him. While Tecumseh was traveling, both sides readied for the Battle of Tippecanoe. Harrison assembled a small force of army regulars and militia in preparation to combat the Native forces. On November 6, 1811, Harrison led this army of about 1,000 men to Prophetstown, Indiana, hoping to disperse Tecumseh’s confederacy. Early next morning, forces under The Prophet prematurely attacked Harrison’s army at the Tippecanoe River near the Wabash. Though outnumbered, Harrison repulsed the attack, forcing the Natives to retreat and abandon Prophetstown. Harrison’s men burned the village and returned home. This was the end of Tecumseh’s dream of a united native alliance against the whites. The Indians were filled with great terror … the trees and wigwams shook exceedingly; the ice which skirted the margin of the Arkansas river was broken into pieces; and most of the Indians thought that the Great Spirit, angry with the human race, was about to destroy the world. The Muscogee (Creek) who joined Tecumseh’s confederation were known as the Red Sticks. They were the more conservative and traditional part of the people, as their communities in the Upper Towns were more isolated from European-American settlement. They did not want to assimilate. The Red Sticks rose in resisting the Lower Creek, and the bands became involved in civil war, known as the Creek War. This became part of the War of 1812 when open conflict broke out between American soldiers and the Red Sticks of the Creek. Portraits of the Choctaw chief Pushmataha (left) and Tecumseh.These white Americans … give us fair exchange, their cloth, their guns, their tools, implements, and other things which the Choctaws need but do not make … They doctored our sick; they clothed our suffering; they fed our hungry … So in marked contrast with the experience of the Shawnees, it will be seen that the whites and Indians in this section are living on friendly and mutually beneficial terms. ———————Where today are the Pequot? Where are the Narragansett, the Mohican, the Pocanet and other powerful tribes of our people? They have vanished before the avarice and oppression of the white man, as snow before the summer sun … Sleep not longer, O Choctaws and Chickasaws … Will not the bones of our dead be plowed up, and their graves turned into plowed fields? After William Hull‘s surrender of Detroit to the British during the War of 1812, General William Henry Harrison was given command of the U.S. Army of the Northwest. He set out to retake the city, then defended by the British Colonel Henry Procter together with Tecumseh and his forces. A detachment of Harrison’s army was defeated at Frenchtown along the River Raisin on January 22, 1813. Some prisoners were taken to Detroit, but Procter left those too injured to travel with an inadequate guard; they could not prevent some of his Native American allies from attacking and killing perhaps as many as 60 wounded Americans, many of whom were Kentucky militiamen. The Americans called the incident the “River Raisin Massacre.” The defeat ended Harrison’s campaign against Detroit, and the phrase “Remember the River Raisin!” became a rallying cry for the Americans. The Shawnee in Missouri migrated from the United States into Mexico, in the eastern part of Spanish Texas. They became known as the “Absentee Shawnee.” They were joined in the migration by some Delaware (Lenape). Although they were closely allied with the Cherokee led by The Bowl, their chief John Linney remained neutral during the 1839 Cherokee War. During 1833, only Black Bob’s band of Shawnee resisted removal. They settled in northeastern Kansas near Olathe and along the Kansas (Kaw) River in Monticello near Gum Springs. The Shawnee Methodist Mission was built nearby to minister to the tribe. About 200 of the Ohio Shawnee followed the prophet Tenskwatawa and had joined their Kansas brothers and sisters here in 1826. During the American Civil War, Black Bob’s band fled from Kansas and joined the “Absentee Shawnee” in Indian Territory to escape the war. After the Civil War, the Shawnee in Kansas were expelled and forced to move to northeastern Oklahoma. The Shawnee members of the former Lewistown group became known as the “Eastern Shawnee”. The former Kansas Shawnee became known as the “Loyal Shawnee” (some say this is because of their allegiance with the Union during the war; others say this is because they were the last group to leave their Ohio homelands). The latter group appeared to be regarded as part of the Cherokee Nation by the United States because they were also known as the “Cherokee Shawnee” and were settled on some of the Cherokee land in Indian Territory. In 2000 the “Loyal” or “Cherokee” Shawnee finally received federal recognition independent of the Cherokee Nation. They are now known as the “Shawnee Tribe”. Today, most members of the three federally recognized tribes of the Shawnee nation reside in Oklahoma. According to a mid-19th century historian Henry Harvey, their government was by kings, which they called sachema, [or sachems] who reigned by succession in the matrilineal line. For instance, the children of a king would not inherit the position. The sons of his brother, by the mother, or the sons of his sister (and after them, the sons of her daughter) would reign. Women did not inherit such a position directly. Harvey suggested that the Shawnee relied on this system of descent because a woman’s sons would always be considered legitimate. Chillicothe (Principal Place), Chalahgawtha, Chalaka, Chalakatha; The Principal division of “Tschillicothi”, appointed by the 1st Lead Illini or man Kwikullay. The is a state-recognized tribe in Alabama, recognized by the Alabama Indian Affairs Commission under the Davis-Strong Act. It is recognized in an honorary manner by Ohio in Ohio Senate Resolution 188, adopted February 26, 1991, and by the Ohio House of Representatives 119th General Assembly Resolution No. 83, adopted April 3, 1991. and Kentucky, by Governor’s Proclamation dated August 13, 1991. The Piqua Shawnee tribe performed the Green Corn Dance in Cumberland Gap National Historical Park in 2011. Cornstalk (1720–1777), led the Shawnee in Dunmore’s War of 1774. Nas’Naga (1941–2012), novelist and poet in United States. ^ “Algonquian, Algic”. Ethnologue. Retrieved April 28, 2016. ^ “Shawnee”. Ethnologue. Retrieved April 28, 2016. ^ Clark, Jerry. “Shawnees”. Tennessee Encyclopedia of Culture and History. Retrieved September 11, 2008. ^ Voegelin, Carl F. 1938–40. “Shawnee Stems and the Jacob P. Dunn Miami Dictionary.” Indiana Historical Society Prehistory Research Series Volume 1, No. 8, Part III, p. 318 (October, 1939). Indianapolis. ^ “Shawnee Myth. Story of a Year. Old Sawage and her Grandson.” MS 3906, Smithsonian Institution National Anthropological Archives. Myth collected by Jeremiah Curtin. 1850s-1880s. ^ C. F. Voeglin, fieldwork notebook XII, “Big Sacred Lizard”; fieldwork 1933–34. ^ Charles Augustus Hanna, The Wilderness Trail: Or, The Ventures and Adventures of the Pennsylvania Traders on the Allegheny Path, Volume 1, New York: Putnam’s sons, 1911, esp. chap. IV, “The Shawnees”, pp. 119–160. ^ Carrie Hunter Willis and Etta Belle Walker, Legends of the Skyline Drive and the Great Valley of Virginia, 1937, pp. 15–16; this account also appears in T.K. Cartmell’s 1909 Shenandoah Valley Pioneers and Their Descendants p. 41. ^ McWilliams, Richebourg; Iberville, Pierre (February 28, 1991). Iberville’s Gulf Journals. University of Alabama Press. p. 175. ISBN 9780817305390. ^ Not to be confused with the nearby French Margaret’s Town; see John Franklin Meginness, Otzinachson: A History of the West Branch Valley of the Susquehanna (rev. ed., Williamsport, PA, 1889), 1:94. Ostonwakin is also spelled Otstonwakin. ^ Gevinson, Alan. “Which Native American Tribes Allied Themselves with the French?” Teachinghistory.org, accessed September 23, 2011. ^ Jones, Charile (November 1987). “Sharing Choctaw History”. Bishinik. Retrieved October 1, 2013. ^ Sherman, William Tecumseh. “H.B. Cushman, History of the Choctaw, Chickasaw and Natchez Indians (Greenville, Texas: 1899), 310 ff., quoted in “Survival Strategies““. Digital History. University of Houston. Retrieved April 28, 2016. ^ Turner III, Frederick (1978) . “Poetry and Oratory”. The Portable North American Indian Reader. Penguin Book. pp. 246–247. ISBN 0-14-015077-3. ^ “Kentucky: National Guard History eMuseum – War of 1812”. Kynghistory.ky.gov. Archived from the original on March 2, 2009. Retrieved October 22, 2008. ^ a b Lipscomb, Carol A.: “Shawnee Indians” from the Handbook of Texas Online. Retrieved February 21, 2010. ^ Society, Kansas State Historical (March 27, 2019). “Collections of the Kansas State Historical Society”. The Kansas State Historical Society. – via Google Books. ^ “Indian Appropriation” (PDF). The New York Times. March 15, 1853. p. 3. ^ Harvey, Henry (1855). “1”. History of the Shawnee Indians: From the Year 1681 to 1854, Inclusive. Cincinnati: Ephraim Morgan & Sons. p. 18. ^ a b Watson, Blake A. “Indian Gambling in Ohio: What are the Odds?” (PDF). Capital University Law Review 237 (2003) (excerpts). Archived from the original (PDF) on September 27, 2007. Retrieved September 30, 2007. Ohio in any event does not officially recognize Indian tribes. Watson cites legal opinions that the resolution by the Ohio Legislature recognizing the United Remnant Band of the Shawnee Nation was ceremonial and did not grant legal status as a tribe. But, the tribe noted that confirmation of the Remnant Band’s recognition was referred to in official letters and they presented it in 1981 to the Bureau of Indian Affairs and The President of the United States. ^ Koenig, Alexa; Stein, Jonathan. “Federalism and the State Recognition of Native American Tribes: A Survey of State-Recognized Tribes and State Recognition Processes Across the United States”. Santa Clara Law Review Volume 48 (forthcoming). pp. Section 12. Ohio. Retrieved September 30, 2007. Ohio recognizes one state tribe, the United Remnant Band. . . . Ohio does not have a detailed scheme for regulating tribal-state relations. ^ “Early History”. The Piqua Shawnee Tribe of Alabama. Retrieved February 17, 2013. ^ “State Recognized Tribes”. National Conference of State Legislatures. Retrieved July 14, 2018. ^ “SHAWNEE TODAY”. Big Bear’s Den. 2012. Retrieved February 17, 2013. ^ Catherine Morris (October 9, 2007). “Local Native Americans Host Cultural Dinner”. Cincinnati.com. Cincinnati. Retrieved February 17, 2013. ^ “Shawnee Nation United Remnant Band”. Retrieved February 17, 2013. ^ a b c “Ohio Indian Tribes”. AAANativeArts.com. Retrieved February 17, 2013. ^ “Native American Peace Tree Ceremony guest is former Shawnee Chief”. Eberly College of Arts and Sciences. West Virginia University. October 7, 2009. Archived from the original on June 12, 2010. Retrieved February 17, 2013. ^ “Lower Eastern Ohio Mekoce Shawnee in Wilmington, Ohio (OH)”. faqs.org, Tax-Exempt Organizations. 2013. Retrieved February 17, 2013. ^ “The Inter Tribal Learning Circle”. Fort Ancient. Archived from the original on August 1, 2013. Retrieved February 17, 2013. ^ “Platform Reservation Remnant Band”. Retrieved February 17, 2013. ^ “Platform Reservation Remnant Band Church Of The Shawnee Inc. – Indiana Company Profile”. Bizapedia. April 26, 2012. Retrieved February 17, 2013. ^ Patricia Lowry (June 26, 2006). “Places: Near Fort Necessity, a National Road inn is reclaiming 1830s interior”. Pittsburgh Post-Gazette. Retrieved February 17, 2013. ^ Paul Johnson (January 22, 2008). “Native American Tribe Works Toward National Recognition”. TheLedger.com. Retrieved February 17, 2013. ^ “Shawnee Nation – Ohio Blue Creek Band, Inc. – Ohio Company Profile”. Bizapedia. November 28, 2011. Retrieved February 17, 2013. ^ “Re: [NA-SHAWNEE] the Indiana Blue Creek Shawnee roll”. RootsWeb: NA-SHAWNEE-L. Retrieved February 17, 2013. There was no Blue Creek Band in Indiana…that’s our Band here indigenous to Ohio…documented as late as 1870. You are looking for the Blue River Band. ^ “Kentucky General Assembly 2010 Regular Session HJR-16”. kentucky.gov, updated 9-2-2010. ^ “Kentucky General Assembly 2009 Regular Session HJR-15”. kentucky.gov, updated 5-2-2009. Edmunds, R. David. “Forgotten Allies: The Loyal Shawnees and the War of 1812” in David Curtis Skaggs and Larry L. Nelson, eds., The Sixty Years’ War for the Great Lakes, 1754–1814, pp. 337–51. East Lansing: Michigan State University Press, 2001. ISBN 0-87013-569-4. O’Donnell, James H. Ohio’s First Peoples. Athens, Ohio: Ohio University Press, 2004. ISBN 0-8214-1525-5 (paperback), ISBN 0-8214-1524-7 (hardcover). “Shawnee” . Encyclopædia Britannica. 24 (11th ed.). 1911.